The Active@ LiveCD shell works in a way similar to the KDE or Windows shell. The main interface of the shell appears as a taskbar at the bottom of the screen. Some application shortcuts are located on the Desktop. 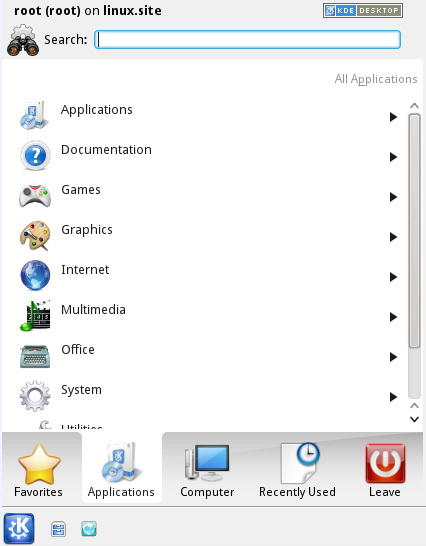 On the left is a start button with the KDE symbol on it. Several quick launch icons appear to the right of the start button. Back up or restore physical and logical hard drives, including folders, data files and installed applications. Recover data from deleted or damaged partitions on attached or external drives, portable drives and memory cards. Recover data from damaged or deleted files or folders. Reset password and user accounts on your Windows system. View and edit disk sector content in raw format. Securely erase data from hard drives in a way that it is impossible to restore the data. Wipe data from unused clusters on a regular basis to make your drive's deleted files or temporary data unavailable to intruders. Monitor the reliability status of your local hard drives to help prevent data loss due to hard drive failure. Documentation — Documents (PDF format) on all applications included with Active@ LiveCD, including the on KDE desktop and utilities. Games – included 3 games (KReversi, KMines, KSudoku) to spend some time while time consuming process (like large hard disk erasing) is in progress. Multimedia – K3b Disk Burning utility allows to rip, edit and burn CD/DVD ISO images, Data and Audio discs. KMix Sound Mixer manages Playback devices. Office – Okular Document Viewer – previews almost all document types (PDF, PS, EPS, DjVu, FB2, eBook, CHM, …). Kate Advanced Text Editor previews and edits text files stored in different code pages. Kompare Diff/Patch Frontend enables you to compare any files bit-by-bit to find out differences, if any exist. Utilities – Ark Archiving tool to create and de-compress TAR, GZ and ZIP archives. KCalc - Scientific Calculator. KSnapshot – Screen Capture Program activated with a PrintScreen key. System – Klipper Clipboard tool manages clipboard content and history. KNetAttach Network Folder Wizard – connects network folders via webadv, FTP, ssh, and Microsoft Windows Network Drive protocols. GParted Partition Editor displays, creates and edits local disks and partitions. YaST2 Expert Partitioner – advanced disk management tool. Supports different types of disks, RAIDs management, Network mappings, Volume management and much more. Apper Software Manager allows to download and install additional RPM packages from OpenSUSE repositories on the web. KSysGuard System Monitor displays and manages all local processes and the System Load. Security – ClamTk Virus Scanner – downloads the latest virus database and scans your local disks for viruses. TrueCrypt GUI application attaches and manages encrypted volumes stored in files. 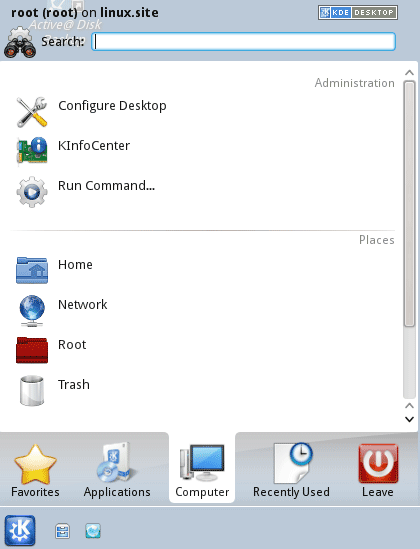 More Programs – KinfoCenter – Info Center – Operating System Summary, Memory, Hardware, Drivers & Network information. Terminal – Konsole Terminal, Super User Mode Terminal and XTerm. Remote Access – Remmina Remote Desktop Client allows to connect to remote hosts using different protocols (RDP, SFTP, SSH, VNC). Telnet is a simple remote console interface. File Managers – Dolphin File Manager – displays, copies/moves and manages files/folders on local disks as well as network attached drives. Krusader File Manager – is a two panel file manager having many advanced features. Displays the most important utilities and applications. Displays shortcuts to the Info Center, Run Command panel, Home folder, Root folder, Network, Trash Can and mounted CD/DVD/USB media. Displays the most recently used utilities and applications. Options to Log out, Lock, Switch user, Sleep, Restart & Shut down the PC.